Initially, each vehicle is assigned a feasible path with a desired speed profile that together satisfy the mission requirements, the vehicle dynamic constraints, and the optimal temporal specifications for each of the vehicles, while ensuring collision-free maneuvers. Then, a path-following algorithm ensures that every vehicle follows its own path independently of the temporal assignments of the mission. a) The reference agent runs as a completely independent member and thus, does not require information from other vehicles. The role of the reference agent is to provide the fleet with the necessary information to enforce temporal constraints. This agent can be perceived as a supervisory control authority, and can be either a virtual or a real agent. b) Leaders have direct access to the data from the reference agent, and communicate with other leaders and followers. In fact, leaders exchange their coordination states with other vehicles to achieve coordination. c) Followers do not have direct communication capabilities with the reference agent. However, each follower shares its coordination state with other followers and leaders. The three fundamental steps are accomplished by judiciously decoupling space and time in the formulation of the trajectory-generation, path-following, and time-coordination problems. Moreover, the approach adopted applies to teams of heterogeneous vehicles and does not necessarily lead to swarming behavior, which is unsuitable for some of the mission scenarios envisioned in this project. Some earlier results have been implemented on Fixed Wing and Quadrotor UAVs. J. Puig-Navarro, N. Hovakimyan, and B. D. Allen. Time-coordination strategies and control laws for multi-agent unmanned systems. In Proceedings of 17th AIAA Aviation Technology, Integration, and Operations Conference, 2017. J. Puig-Navarro, E. Xargay, R. Choe, and N. Hovakimyan. 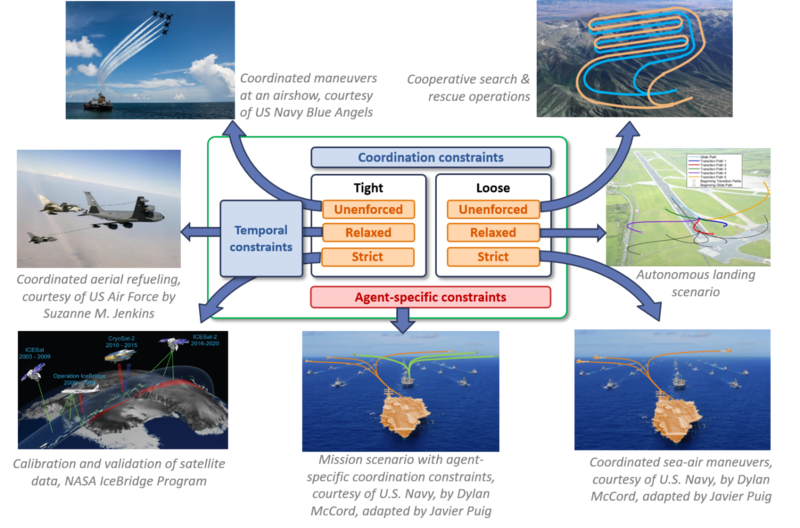 Time-critical coordination of multiple UAVs with absolute temporal constraints. In Proceedings of AIAA Guidance, Navigation and Control Conference, 2015. E. Xargay, I. Kaminer, A. Pascoal, N. Hovakimyan, V. Dobrokhodov, V. Cichella, P. Aguiar, and R. Ghabcheloo. Time-critical cooperative path following of multiple UAVs over time-varying networks. In Journal of Guidance, Control, and Dynamics, Vol. 36, No. 2, 2013. E. Xargay, V. Dobrokhodov, I. Kaminer, A. Pascoal, N. Hovakimyan, and C. Cao. Time-critical cooperative control for multiple autonomous vehicles. In IEEE Control Systems Magazine, Vol: 32, Issue: 5, 2012. V. Cichella, I. Kaminer, E. Xargay, V. Dobrokhodov, N. Hovakimyan, P. Aguiar, and A. Pascoal. A Lyapunov-based approach for time-coordinated 3D path-following of multiple quadrotors in SO(3). In Proceedings of 51st IEEE Conference on Decision and Control (CDC), 2012.